One of the main focuses of our blog is exploring the evolution of journalism and how new media is shaping the way businesses, nonprofits and news organizations share and spread information to their target audiences. In this guest post, Simon Lewis, Editor at Only Marketing Jobs, discusses the impact of social media and niche audience engagement on the evolution of job boards. Job boards, by tradition, provide a platform on which recruiters pay to advertise their vacancies, then wait in anticipation for applications to flood through to designated in-boxes. There is nothing particularly deliberate about the service, and its reactivity is both a strength and weakness. However, in the current climate there is little room for limitations, so while reduced-cost recruitment solutions will continue to feature in most recruiters’ budgets, technological development dictates that unless job boards embrace more innovative strategies, they could see their status stifled by the sophistication of integrated products such as applicant tracking systems (ATS), CV parsing and the prospects of mediation. Help with your divorce Mediation is a time-honored tool for resolving conflicts. It allows you to create a preferred solution. It will also save you time and money while keeping strong emotions from spiraling out of control. In good times, desirable candidates are comfortable, entrenched in their positions and paid well. They are confident. They don’t reach out and share because they see no purpose in it. Conversely, in bad times, everyone feels the need to share, so recruiters are inundated by CVs, most of which are either irrelevant or generic; the latter is as bad as the former — when standing out from the crowd is so important. So what should job boards be doing to ensure their users receive a service that will make them return? What is the future for job boards and how will they tackle the undoubted challenges that lie ahead? The recruitment landscape now is about conversations. Web-savvy jobseekers are communicating in language that is natural, open and honest, sometimes even direct; more direct than recruiters might wish them to be. Everything is changing. People are connecting and working together. The Internet is enabling these conversations, and there is nothing corporations or recruiters can do to stop it. What they can do though, is embrace it: joining the conversation and showing innovation are the only ways to persevere. 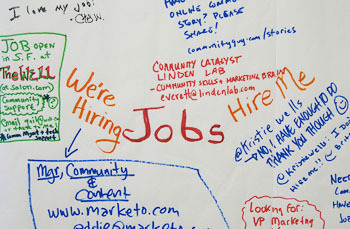 For some job boards, social media has come at just the right time. It provides them with the means of providing information (e.g. advertising jobs), building relationships (with clients and candidates), and conducting forums for discussion on how they can improve as an industry. Most importantly of all, however, social media allows job boards to get messages out from their clients to a far wider audience than many other recruitment channels. And these messages are delivered in real-time, with accuracy. If a job board operates in a niche sector the dissemination of this information is even more specific, even more relevant. A jobseeker looking for IT Support jobs in West Midlands, for example, should be better served by a job board specializing in the that specific field. They return to job boards where the content (and the current age is all about content) is targeted at them. People see tangible value in subscribing to newsletters and feeds, contributing to forums and joining groups, if these items benefit them directly. General sites, while clearly valuable, cannot offer this exclusivity. Their unique visitor stats may be high, but they are unable to harvest customer loyalty. Return rates are relatively low. Sector-specific job boards are also far more likely to be empathetic to their clients. They understand where their visitors are coming from, empathizing with their frustrations and working toward their needs. For niche job board owners, it is essential that they engrain themselves under the skin of their market. General sites have multiple variables and bigger margins for error. If a niche board fails to engage with its audience, it will soon lose its unique identifier and will be dropped in favour of a more meaningful competitor. This is the same for traditional recruitment generalists. Job boards have been around for ages but are still commonly classed as modern-day recruitment media. With the advent and development of social media, however, do job boards now fill a void between traditional recruitment companies and en vogue employment media? Irrespective of the answer it indicates challenging times ahead. Referral-based recruitment will dominate the employment landscape within two years. In the same period social media will evolve and, with it, opportunities to network will be met by a larger number of experienced social-engagers. These people will be accustomed not only to integrating with social spaces but using them to find a job and developing their careers. When the economy recovers it will be the innovators who thrive. Static job boards will die. There are too many potential landmines out there for a “traditional” job board to remain reactive. Get with social engagement or get ready to fail. The full article can be found at Only Marketing Jobs. Photo courtesy of thomas pix, used under its Creative Commons license.